information about Anodized Aluminum and what is it ? If you are browsing this website, then you may also be interested in learning what exactly is anodized aluminum and why does it make a great material for anodized cookware. You may be concerned whether or not it is safe to use and whether or not you should use it in your kitchen. For starters, anodized aluminum is a hard type of metal that is used in a number of items. These items range from satellites to cookware to automobiles. The reason this type of material is used a lot is it is known for its strength and durability. If done right, the process of anodizing can make the material almost as hard as diamond. The process of anodizing aluminum is the same as the process that would be used to weaken metals. Since aluminum is not weakened by oxidation, it is possible to make it much stronger by anodizing it. In order to anodize aluminum, a sheet of aluminum is placed into an acid bath. This makes something similar to a battery where the aluminum is the positive cathode and the acid is the negative anode. Once this is done, a current is then run through the bath and the surface of the aluminum oxidizes or rusts. This forms a strong coat on the surface of the aluminum, creating anodized aluminum. Now it may sound like the idea of rusting might be unhealthy to use for cookware. However, the rust is still part of the aluminum, so it does not come off onto the food, making it still alright to cook on. It is very unlikely for the anodized aluminum to flake off onto the food. This will put any questions about the safety of this material to rest. Overall, this type of material is great to use for many applications. Unless a conductive material is needed, anodized aluminum works out great and is very strong, making it perfect for pots and pans. In addition, the type of material allows heat to spread evenly, and dyes can be used to decorate anodized aluminum, which is also why it is typically used for home products. 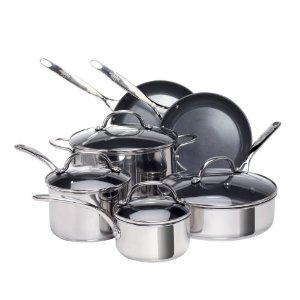 If you are wondering what material to use for your cooking, then anodized cookware is a good option to explore. 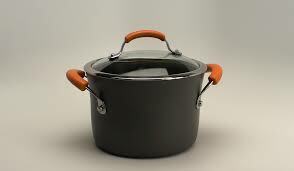 Cookware has always held a very special place in the hearts of all culinary skilled people. A crappy frying pan can spoil both your breakfast and your mood! So can those heavy sauce pans with breakable handles! A poor quality cookware set can take all the fun out of your cooking. To make your cooking more enjoyable than ever, opt for the newT-Fal Ultimate Stainless-Steel Copper-Bottom 12-Piece Cookware Set and notice the difference! 12 essentials make it special!